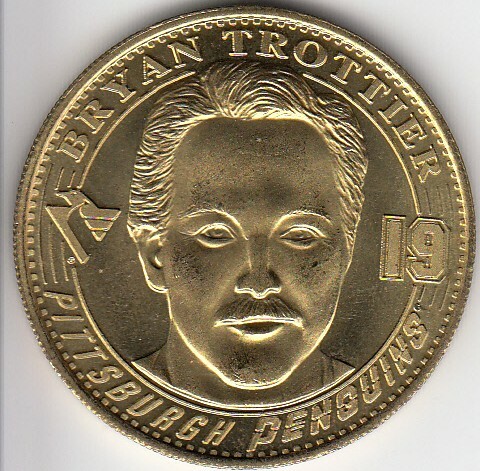 This 1 1/2 inch diameter bronze coin or medallion was distributed exclusively at the March 2, 1998 Pittsburgh Penguins home game to honor former superstar Brian Trottier and his Hockey Hall of Fame induction the year before. 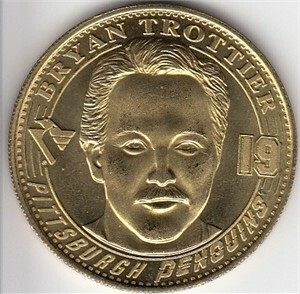 (The back has the Penguins logo and his HOF induction date of Nov. 17, 1997). Weighs 7/10ths of an ounce. Has minor age tarnishing, otherwise perfect. ONLY ONE AVAILABLE FOR SALE.